What is a Color-A-Thon event? 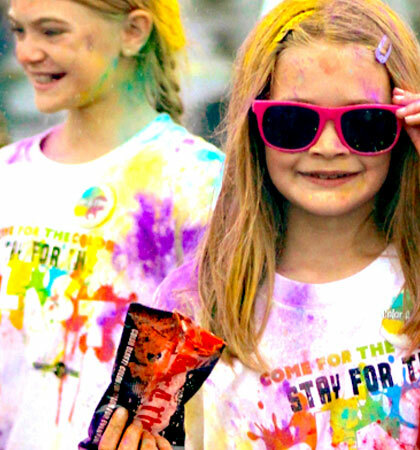 As you run/walk/dance through the course, you will get showered in safe, eco-friendly, plant-based powdered dye at every zone…turning you into a moving target of fun! 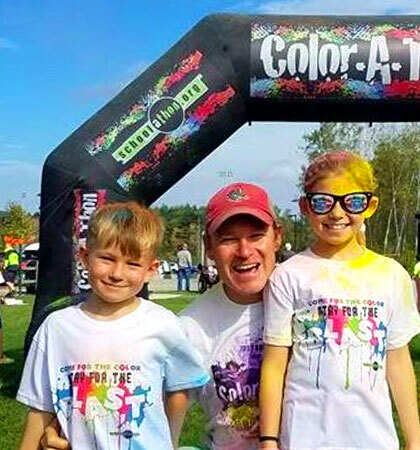 Just when you thought you couldn’t possibly be more colorful, you’ll cross the finish line and find yourself in the middle of a Color Blast at our Finish Line! You’ll jam out with our awesome emcees as they count down to the moment when YOU get to Tie-Dye the Sky and open your color packets to share your blast of color with your friends, family, and everyone else around you. The result is a once-in-a-lifetime experience that many people tell us is the most fun they’ve ever had exercising. But don’t just take our word for it, join the most colorful, most fun color run fundraiser ever! Who can participate? Is there an age limit? If my child is walking/running, can I go also? All students at any age can participate in a Color-A-Thon Event. In fact, we would like students to encourage their friends, moms, dads, aunts, uncles and grammas and grampas to participate. Bring the little ones and push them in a stroller. This is a fun event that entire families can participate in…no matter what age. 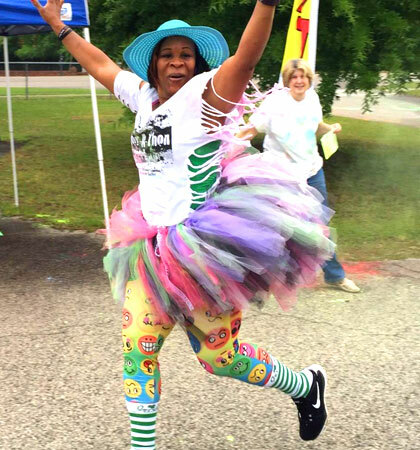 And you don’t have to run…you can walk, dance, skip, stroll, jog, trot or turn cartwheels! So no training is necessary for this event? This event is a FUN RUN! You can do this at your own pace (fast, slow, who CARES! The most important thing is to set your goals and stick to them. Remember, the donations you get go to your school/organization. And don’t forget the fun rewards for each goal you accomplish. We recommend the brightest white to show off ALL the colors… but don’t let that discourage you from going crazy with the brightest accessories you can find. Be adventurous! Create themes with your friends with crazy socks, sunglasses or tutus! For most programs, a white Color-A-Thon t-shirt is provided. How much goes back to our school or organization? School-A-Thon has two programs that will net your school/organization 90 percent or 70 percent, depending on the program you pick. Each one comes with great benefits, but the 70 percent program has so much more to offer in the form of services to make your “thon” easy to run to fantastic rewards for participants. See the difference yourself HERE. You’ll find that with the 70 percent program, you will get more participation, greater donations and better financial results. CONTACT US and we can get you started! What kind of rewards are there for participants? We supply many types of rewards for the students as they get donations. These rewards are cumulative starting with the student’s first donation. Other rewards include t-shirt, bag color packs and more! We also have in-school instant incentive programs. Talk to your representative for details. What kind of support is available for the school/organization? Your School-A-Thon Representative will be with you through each step of your event, whether it’s a Color-a-Thon or a thon of your choosing. You will receive a Step-By-Step Color Guide, marketing pieces such as flags, poster, brochures, parent letters and Donation envelope. You will also have access to our Money Manager Software which makes collecting and organizing donations simple and easy. The students will have their own custom online donation site where they can upload their picture, message and individual fundraising goal and then email to friends and relatives across the country. This creates a broader reach for your fundraising efforts. Contact a sales rep to find out more. Tell me about the R.E.A.C.H. program. School-A-Thon provides a fun and interactive R.E.A.C.H. Program that teaches life lessons plus promotes your event! Check it out HERE. Do the students have to solicit for donations door-to-door? Asking for donations can be a very good lesson in self-confidence and salesmanship, but we want students to be safe. We suggest that students only go to friends, relatives and neighbors they know WITH an adult. How does the online donation site work? Each Student registers online and creates their own donation site. They can upload their picture, create a message and share what their individual fundraising goal is. They can then email a link to their page to friends and relatives across the country! Online donations are made with a credit card and is processed with the School-A-Thon Money Manager Software. What is the color blast dust made of? Is it safe? Our Color Blast Dust is safe, non-toxic and completely washable! Our powder is a non-toxic, non-rash-inducing colored corn starch. For your safety we have had it tested for health and flammability. Download the Color-A-Thon Color Dust Information PDF. Will my clothes ever be the same? The Dye we use is completely safe and will wash out of your clothes – but we don’t do your laundry so results may vary depending on detergent, temperature, etc. For this reason we recommend you wear stuff that you don’t mind getting a little colorful. Will the color dust wash out of my hair? The color dust dye is made of colored cornstarch and is designed to be 100% washable. If you have light-colored hair, or if it’s expected to be rainy or a particularly humid day when you participate in a color run event, we suggest adding some leave-in conditioner.